PHAs are a family of naturally occurring polymers – no plastics in the usual sense of the word, but energy reserves of microorganisms. A very versatile family: we can process them to hard or soft plastics, and to both crystalline and amorphous polymers. And, very important: all members of the PHA family are biodegradable; not just in industrial composting equipment, but also in the soil and in freshwater and seawater – the only other plastics family with those properties are starch plastics. PHA can be bought in the form of granules. As yet, PHA production worldwide is very low, and yet this plastic has a very large potential. PHAs (full name: polyhydroxyalkanoates) are not produced, like most plastics, by connecting molecules in a reactor with the assistance of a catalyst, but by microorganisms, that synthesise the compound in their cells. In the nineties, some companies tried to market PHAs and failed; plastics marketers have become weary of them ever since. Companies developing the plastic have tried in vain for a long time to market it on the basis of its biodegradability. According to Jan Ravenstijn, a well-known consultant in the area of bioplastics who chaired a session on PHA at the Bio-Based Materials conference in Cologne last April, they neglected the laws of polymer marketing in doing so. In bioplastics marketing, quality and price come first; only if a PHA fulfils the necessary price/quality ratio requirements, biodegradability will lend an extra and strong sales argument. PHAs are very easy to process. They can be blown and moulded, foamed and processed into yarns. They make excellent packaging materials, also for food packaging. They can be printed, sealed, painted. Mixing with other plastics will often improve the qualities of the latter. Because of its large variety, PHA can substitute almost all major plastics in many of their applications: polyethylene, polypropylene, polystyrene, PVC, PET. PHAs can be processed to glues. Some kinds of PHA can be used as implants, the material will be entirely resorbed by the body in the course of time. There seems to be just one impediment: price. This is too high yet for most applications. What can producers do about that? 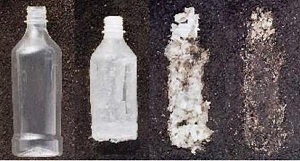 Biodegradable PHA bottles disintegrate in the soil within 2 months (but remain intact as long as they are not discarded). One of the most important options open to producers, Jan Ravenstijn said in his Cologne speech, is to form alliances in the value chain. Continually, all links in these chains need improvement. Raw materials suppliers aim for increasing the value of their (waste) streams; compounders and part manufacturers aim for good processing performance; markets aim for new product functionality and/or a good brand image; consumers aim for biodegradability performance and environmental advantages. Ravenstijn specifically mentioned Bio-On, Newlight Technologies and TerraVerdae as companies that put much effort into the build-up of their networks. On this site, we discussed earlier the remarkable agreement of Newlight Technologies with IKEA. And Mango Materials, a company that pursues another strategy and produces PHA from CH4, produced as a waste gas from sites like landfills and abandoned coal mines. Others develop ways to produce PHAs from fatty acids in wastewater streams of the food industry or from sewage stations. In Cologne, some companies highlighted the special properties of their PHA. Metabolix specialises in PHA copolymers. Together with PLA, it produces a plastic that can compete with HDPE. And in a mix with biopolymers, PHAs improve biodegradability. Bioplastech, a spin-off of the University of Dublin, produces PHA from plastic waste through bacteria. 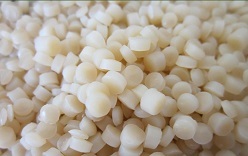 KANEKA, a major Japanese plastic producer, develops varieties with good heat-resistant properties (e.g. for plastic cups) and varieties that can be used as a biodegradable agricultural plastic. Spanish AIMPLAS develops fire-resistant PHA panels for the automotive industry. And levulinic acid improves PHA properties, according to GF Biochemicals, that produces and markets biobased levulinic acid. All said, the PHA sector should not leave out of sight the advantages of biodegradability, according to Jan Ravenstijn. The sector should always highlight that plastics have and end-of-life phase. What will happen if the product breaks down, or is discarded because it is no longer useful? The problem of the plastic soup in the oceans is staggering. In nature, ordinary plastics break down to little unnoticeable fragments that can easily enter into the food chain, according to Christian Bonten of the Institut für Kunststofftechnik IKT. We should not allow them to escape, they should be controlled and recycled. But at present over 85% of all packaging materials are discarded to the environment, which equals 1 to 2 truckloads of plastic each minute (right now; without any subsequent action, this might be 3 to 4 times as much in 2050). Biodegradable plastics like PHA will be at least part of the solution to that problem. Hi Can you tell me if PHA needs to be put in an industrial composter to biodegrade please? If left in the environment or landfill how long will it take to biodegrade then? Thank you.